This autobiography of the prominent Church of Scotland minister Alexander Carlyle (1722-1805) was eventually published in 1860, in an edition by the historian John Hill Burton (1809-81). 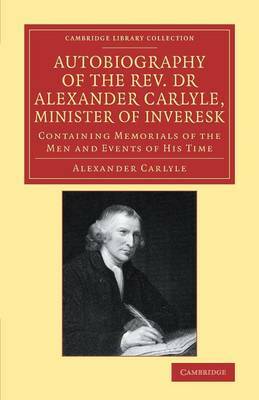 Carlyle had left instructions to his executors to publish not only his memoirs but also his sermons and other writings, but only this book and two other items were ever produced. Carlyle states in the first chapter that he began this work on his seventy-eighth birthday, 'having observed how carelessly, and consequently how falsely, history is written'. His account of his life and times is hugely entertaining, ranging from his role in the failed defence of Edinburgh in 1745 to playing golf at David Garrick's villa. His acquaintance in the intellectual circles of Edinburgh and London was wide, including Smollett, Elizabeth Montagu, John Wilkes, and Benjamin Franklin. This humorous and hugely entertaining work offers a fascinating insight into eighteenth-century social history.